" ... Its leader ... Bal Thackeray, has ruled Mumbai like a Mafia don. ... He has compared himself to Hitler, for whom he once professed love, and said India needs a dictator. 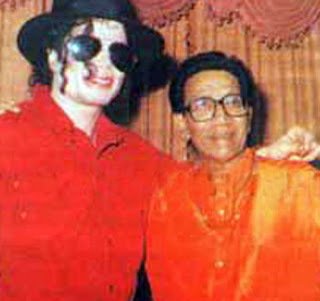 ... "
Michael Jacksonji, Indian guru, RIP. In the mass grief for the previously disgraced but now legendary Michael Jackson, one important and unique aspect of his life appears to have been overlooked: cultural guru for all right-thinking Hindu youths. 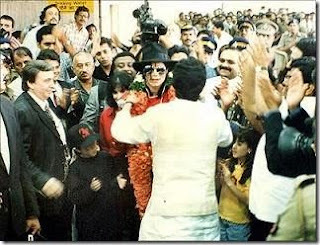 When the artist formerly known as ‘Wacko Jacko’ visited Mumbai in 1996, his concert was promoted by the Shiv Sena, the Hindu traditionalist, Marathi regionalist party whose street thugs operate as an organised crime syndicate, terrorising ‘outsiders’ and working extortion rackets in Bollywood. Its leader, the ailing former political cartoonist Bal Thackeray, has ruled Mumbai like a Mafia don, and his pronouncements on how Hindus should live are taken very seriously. He has compared himself to Hitler, for whom he once professed love, and said India needs a dictator. On the street level his thugs have beaten up young lovers holding hands on Valentine’s Day, a celebration he has denounced as a western incursion into traditional Indian modesty. 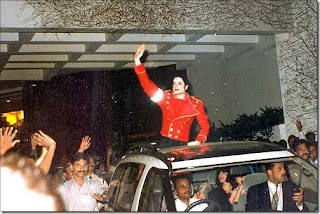 The first words uttered by Jackson upon arriving in India during his 1996 tour: "I am very happy to be here in India ... in support of charity"
"So is Michael Jackson, a popular singer, being rash in planning a rock concert in Mumbai (Bombay) this week-end? Not at all. He has struck a deal to give 85% of the net profit from the concert to a charity run by the son of Bal Thackeray, head of the Shiv Sena, a local political party. ... "
Mumbai: The King of Pop, Michael Jackson, had a tryst with the celluloid city 13 years ago, when he mesmerised thousands of Mumbaikars with his performance at a concert. Jackson performed at a packed concert here in 1996. The event was organised by Shiv Udyog Sena, an outfit floated by then Shiv Sena leader Raj Thackeray with the objective of providing jobs to 27 lakh youth in Maharashtra.